Event: Jon Walsh - 8pm - Jon will be playing an evening of acoustic blues, ragtime and some originals too. 8pm start. Event: Martin Fieber & the Customtones - 9pm - Blues, Country, swing and surf with a twang. The hottest slide guitar in town. Event: Ben Hudson - 8pm - For those of you who have seen this guy play before, you will require no encouragement to see his last gig before he moves abroad. For those of you who haven't seen him before, well this is your last chance! It's going to be a blinding evening! Event: Northern Soul @ The RBL Salisbury - 7pm - Yet another night of Northern Soul. Five DJs bring you five hours of classic Northern Soul. Event: Seven Drunken Nights: The Story of The Dubliners - 7.30pm - For ticket details or more information visit www.cityhallsalisbury.co.uk/index.php?page=... - Seven Drunken Nights brings to life the music of Irelands favourite sons - 'The Dubliners. Telling the story of a career spanning 50 years and evoking the spirit of Ronnie Drew, Luke Kelly, Barney McKenna, Jim McCann, Ciaran Bourke and John Sheahan this hugely talented cast of musicians and singers bring the music of this iconic group to life. Event: Live Lunch: The Portraits - 12-2pm - Free entry - For more information visit www.wiltshirecreative.co.uk/whats-on/salis... - Visit The Portraits on Facebook: www.facebook.com/theportraitsmusic. As heard at Glastonbury Fest and on BBC Radio 2, Singer Songwriting duo, Acoustic Pop with a Story, a Heart and a Universal Conscience. Event: Cara Dillon - 8pm - For ticket details or more information visit www.wiltshirecreative.co.uk/whats-on/salis... - According to Mojo Magazine, Cara Dillon has 'quite possibly the worlds most beautiful female voice'. Join this exceptional Irish singer for a collection of beautiful and moving songs, including material from her new album Wanderer. Event: Matt Black Piano Man - 7.30pm - Matt Black website: www.matt-black.org. Matt Black on Facebook: www.facebook.com/Matt.Black.Pianoman. Solo musician covering a variety of styles. Matt Black is a musician, comedian, recording engineer and record producer. In the 20+ years that Matt has been earning a living in the entertainment world, he has consistently altered his stage persona to meet the requirements of his audience, be they guests at a society wedding, delegates at a business conference or corporate dinner, or bikers attending a rally. Whether it's one of Matt's comedy nights where he will have the audience roaring with laughter, or a rather more refined Matt which fits perfectly in a restaurant, wine bar or wedding environment, his musical repertoire from classical or jazz to modern day will amaze. Event: The Duskers - 8pm - The Duskers on Facebook: www.facebook.com/theduskers. Country rock band from Salisbury. Event: Fret n Keyz - 9pm - Acoustic duo covering 60s to the present day. Fret n Keyz on Facebook: www.facebook.com/fretnkeyz. Salisbury-based acoustic duo who cover a wide variety of music from the 60s to the present day. Event: Mother Ukers - 9pm - Ukulele band performing modern day classics in their own style. Mother Ukers on Facebook: www.facebook.com/motherukers. Mother Ukers website: www.motherukers.com. The Mother Ukers are proving to be a big hit on the musical entertainment scene, performing a repertoire of songs you know in their own unique 1920s ukular style. Their eclectic mix of music genres blended with subtle comedy and smart gentry, steam punk image has also allowed them to take steps out of the ukulele scene and further into the entertainment industry. Event: The Treblemakers - 9.30pm - The Treblemakers are at Shrewton club this Saturday from 9.30pm, non members welcome for less than the price of a pint. Covers band playing songs from the 50s to the present. The Treblemakers on Facebook: www.facebook.com/treblmkrs. The Treblemakers play covers from the 50s to the present day. Having male and female vocalists gives them the scope to play anything that gets you up and dancing. Event: The Consultancy - 9pm - Live rock and blues - with a twist of jazz!. The Consultancy on Facebook: www.facebook.com/theconsultancybandhants. The Consultancy website: www.theconsultancyband.co.uk. 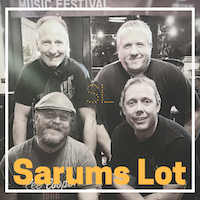 A Hampshire based rock/blues/jazz band who are achieving growing acclaim with their own songs plus great mix of classic rock, indie and blues with a twist of jazz. Event: Open Mic - 7.30pm - 8-11pm. Backline supplied. Open to all genres. Acoustic / backing tracks welcome.